Muffins generally come into two kinds: The English Muffin and the Corn Muffin. 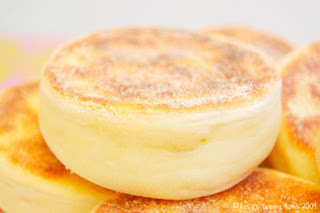 The English muffin is a kind of light bread leavened with yeast. It is often baked in a flat-sided 8cm diameter disc-shaped tin. It is then split into two, toasted and then served with butter. 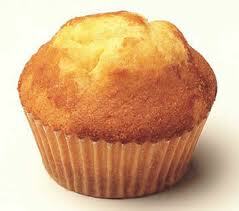 The Corn Muffin on the other hand is made out of cornmeal. They are often shaped cornbread and are usually sweeter. Baking muffins is pretty easy and does not have many ingredients and usually takes only twenty minutes. In order to start baking your own delicious muffin, you should have 250g of plain flour, one large egg, 85g of sugar, 3 teaspoons of baking powder, ½ teaspoon of salt and three ounces of softened butter in a cup within an oven. With these ingredients, you can either make six big muffins or twelve small ones. You should also have a large mixing bowl for the dry ingredients, a fine metal sieve, a smaller mixing bowl for the wet ingredients, a cup or mug for butter, one teaspoon dessert spoon, a non-stick muffin tray with built-in paper cases place in holes, a wooden spoon balloon whisk or fork, a packet of chocolate chips around a hundred grams, a good vanilla essence an 8 oz milk which is over 200cc. The first thing that you have to do is lighting your oven and putting it either at 5 or 6 if you are using a gas oven. Pour the sugar and the chocolate chips into the bowl and sieve just above the big mixing bowl on to the sugar and chocolate. Pour the flour mixed with salt and the baking powder unto the sieve. Afterwards, crack the egg into the smaller bowl and beat it until it looks pale yellow. The put milk in it and mix it again. Take the butter out of the microwave and light it up to five or six. This is already dependent on your oven though. Then pour the butter into the small bowl where you had the egg mixed with milk. Make sure to mix it frequently so that the butter will not become too hard and lumpy. After this, put two teaspoons of vanilla essence unto it. Combine the wet mixture to the dry mixture using the wooden spoon. Using the dessert spoon, fill the paper cups in the muffin tray. The content should be around half of the paper cup’s size. Fill the muffin cases enough for it not to spill and put it inside the oven. Give it around ten minutes before opening the oven. You can peek and touch the muffin’s surface. Now, if they are still soft, it means that they still need a few more minutes to be baked. Otherwise, you can now pull them out of your oven and enjoy the fruits of your baking. Chocolate is a by-product of fermented cocoa beans. These beans are eventually dried, cleaned, and then roasted. The shell is later removed to produce cacao nibs which are grounded then liquefied. The liquefied form becomes chocolate liquor which is made out of pure chocolate. In addition, this liquor can be furthered turned into two components which can be used for cooking: cocoa solids and cocoa butter. And the great thing about these two components is that they can be used to cook chicken mole poblano. 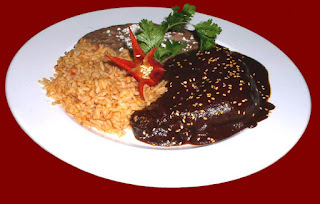 If you are not familiar with a mole poblano, it is the national dish of Mexico. It has at least twenty ingredients which also includes chili peppers and complemented by chocolate. If you are interested in cooking this delicacy, you should have the following ingredients: three ancho chillies, 3 pasilla chillies, 3 mulato chillies, 1 finely chopped-onion, 3 crushed garlic cloves, 30 grams of toasted almonds, 30 grams of toasted sesame seeds, 1 tsp of ground coriander, 6 large chopped, de-seeded, blanched and peeled ripe tomatoes, 60 grams of raisins, 60 grams of dark chocolate having at least 70% cocoa content, 150 milligrams of chicken stock, 1 tsp of ground cinnamon lard for frying, 1.8 kilograms worth of chicken pieces, and some black pepper for flavoring. Though that is a pretty lot of ingredients, the result will be worth it. What you have to do first is to remove the stem and seed of the chillies then toast them in a dry frying pan for a couple of minutes. Make sure to stir it frequently so that it will not stick to the pan. Then transfer the chillies to the stock and allow the chicken stock to rehydrate for at least twenty minutes. After twenty minutes, remove the chillies from the stock and put them in a blender along with the onions, garlic, almonds, sesame seeds, spices and add some black pepper until they become a smooth paste. Afterwards, melt the chocolate in a bain-marie or double boiler then put a little lard to the frying pan. Use this so you can fry the raisins until they are all puffed up. Once you are done, remove them and set them aside first. Add a little more lard unto the frying pan and then fry the chili paste in it for a few minutes. Put the chicken stock along with it and then add the tomatoes and the raisins. Bring it to a boil and cook it for around 15 minutes. Make sure that the sauce thickens before putting the chocolate next. On the other hand, fry the chicken in a large frying pan until it turns brown then transfer it to a casserole dish and cover it with sauce. Place it in an oven and pre-heat it to 180 celcius and bake for 15 minutes. After 15 minutes, you can now enjoy your Mole Poblano.